Subject: Buisness Proposal .Can I Trust You?? Subject: Re: Buisness Proposal .Can I Trust You?? The fact that you don't tell me what this business venture actually is, is discerning. So much so that I think I need to demand a 60% cut instead of the 40%. Also, I want my cat to get a 3% cut because he's so cuddly wuddly caddly. This would leave you with 37% cut, excluding all the other cuts that I'll come up with in the future. Is this okay to you? Subject: Carefully read this mail and get back to me. move this fund to a different account . I can Invest over there in your country. transaction will bring the two families together as one . understand so that I will clarify you very well. fund into your account without any delay, so keep this top-secrete. with you over there in your country.. Expecting to hear from you soonest. Extend my greetings to your entire family . CURRENT POSITION/ Telex Manager /YOURS??? Subject: Re:Carefully read this mail and get back to me. I want you to know I have carefully read your mail partly and will read the rest when my erection goes away. It might take a while, this happens sometimes. Don't worry about that though. In the meanwhile, I want to get back to the percentages. Do you really think we are going to make phonecalls to each other with over 1 million dollars worth? Because, and this may be just me, but I think that sum should be around 5 dollars. Therefore, and because this thing is constantly changing, I have decided to make a graph showing you how the percentages will be dealt with. I have added a couple new points that we can discuss about but I'd rather not. Please look at the graph attached to this mail and tell me are you down with the game, are you ready to walk the talk, are you ready to get down with sickness. 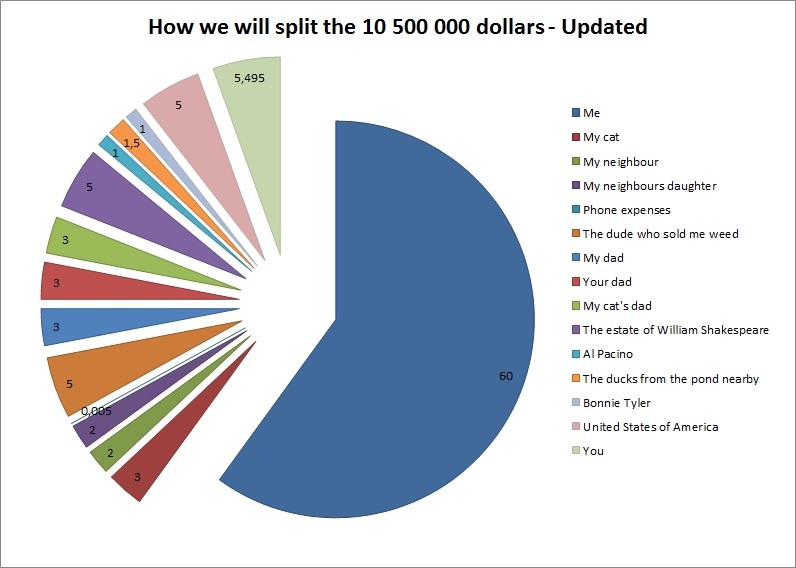 Here's an even more updated graph on how we should split the money. 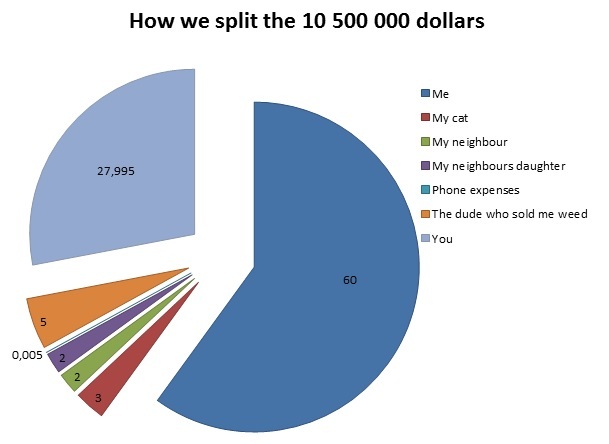 I have taken some liberties regarding the way we split the money, in such way that none of the money that goes to new recipients comes from my end. Is this okay to you? Should we proceed?